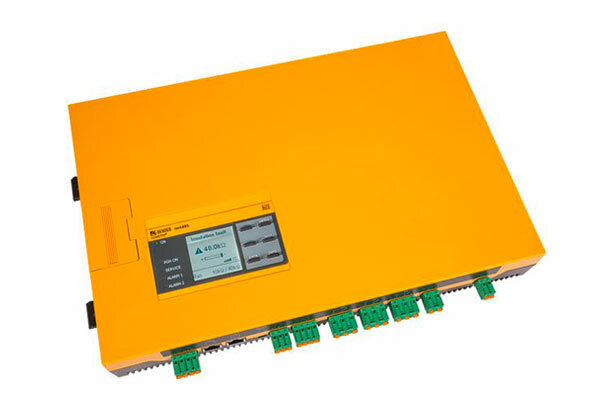 The ISOMETER® isoxx1685Dx-x25 is used for insulation monitoring of extensive IT systems. The specially developed measurement method monitors the insulation resistance also in installations where extremely high system leakage capacitances against earth exist due to interference suppression methods. Adaptation to system-related high leakage capacitances also occurs automatically. The ISOMETER® iso1685Dxx generates locating current pulses required for insulation fault location. That allows the localisation of the insulation fault using permanently installed or mobile insulation fault locators.